When will my sarracenia open? I agree with you it won’t loik healthy- plants usually do take a while to recover when they are repotted and that isn’t just sarracenia; it’s the same with other plants. One pitcher is starting to open but probably won’t be all the way until late June honestly. currently in sphagnum and is in a south-garden. I repotted it in April and it developed transplant shock; its since recovered and many new pitchers have grown and they do get quite chunky but have still not opened. I was wondering if the transplant shock means that they are unlikely to develop all the way to opening this year. Ig that’s the case could somebody please give advice as regards giving the plant nutrients which it should be getting through bugs etc. Thankyou! My sarracenia (recently repotted last month) is going reddish? Usually the balcony or a windowsill but it spent three days in a relative’s back garden recently whilst I was there, and thus it got a whole day’s sun on each day it was there. It’s now my cover photo; it’s just anthocyanin. It looks like it’s just anthocyanins; it actually looks quite nice. 18W LED Grow Light On Sarracenia? I have an apartment with moderate sun in the morning through eastward balcony; over past week, my sarracenia has been in a relative’s garden and the direct sunlight has really helped it. I was wondering whether a grow light would help it maintain good growth and strong stems if used during the night in the apartment as otherwise it will only get 4 hours direct sun in the morning on the balcony or living room windowsill. Have previously used an 18W LED Grow Light on bonsai and it did a good job so was hoping it would on the sarracenia also. as said, it already gets direct sun in morning so it’s only necessary later in the day. Thankyou! Would 18W LED Grow Light help out my normally sun starved sarracenia? My sarracenia is going red on its pitchers which are growing; is this normal? Last year pitchers were totally green; this year they are going red in areas like a person with a heat rash. Tried uploading photo but it didn’t work. Miraculously it’s still alive; just waiting on it to totally recover, now. But you’re certain it will recover providing its soil is kept moist but not clogged? Have just been tugging at it to check it still has roots and there are some as it wasn’t just pulling out the soil easily. 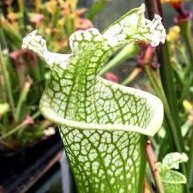 The reason the new pitchers are all curved over right now is because it has transplant shock, but that should clear by the weekend- have cut back the dead pitchers and am keeping it well watered. It was necessary to transplant it because it’s prone to white spot mildew and in the vase it came in it was a chore to pick away at any low lying pitchers which had gone white. Still, with watering and some sun the roots should recover and the transplant shock end. Hi Alexis, it's usually positioned on my balcony getting a good amount but have had to put it inside when out as we’ve had plants and garden lights stolen in my area recently. Pathetic. But welcome to Guildford. Admittedly, it’s got some transfer shock since being repotted but that horrible vase it was in was going to kill it- it nearly did last summer.